Living well never tasted soooo good! If you or someone you love is at risk for or has been diagnosed with breast cancer, rest assured that you have powerful healing medicine in the food you eat every day. The reality is that certain foods are nature's cancer-fighters because they are rich in cancer-healing phytochemicals (natural plant chemicals). Not only are they helpful in preventing cancer, but certain fruits, vegetables, seeds, herbs, and spices are rich in nutrients that are proven to inhibit cancer by actually turning off cancer genes and reducing cancer cell growth. These compounds can change the course of cancer. In fact, many of the more progressive cancer clinics worldwide are starting to incorporate this research into their nutrition protocols to support and empower their patients throughout treatment. Targeting nutrition by prescribing nutrients based on an individual's needs not only supports healing but also enhances treatment efficacy. As a clinical nutritionist specializing in medical nutrition therapy, I have been developing protocols and dietary guidelines for more than twenty years. Early in my career, it became clear to me that my cancer patients needed answers to their dietary quandaries. Many of them were unable to eat heated foods because the smells triggered nausea, so they frequently preferred cold foods. Some of my patients reported that they couldn't eat much at one sitting so I made sure that the foods I recommended for them were nutrient dense, without extra carbohydrates and unnecessary bulk. Most of them were avoiding dairy products as they tend to increase mucus production and many of my new patients needed to gain muscle weight that had been lost due to treatment. I could see that I would need to find creative ways to help them get proper nutrition. Some of the nutrient deficiencies that my patients were experiencing were very serious, such as cachexia, which is a wasting syndrome characterized by weight loss, muscle atrophy, fatigue, weakness, and loss of appetite. Cachexia not only affects quality of life but is also estimated to be the cause of death in 15 to 20 percent of all cancer patients. The treatment for this type of muscle loss is protein powder (amino acids) and specifically creatine, so I began adding protein powders to the smoothie formulas I created for them. Once I saw how quickly a targeted approach to nutrition could reverse a condition, I became focused on personalized medical nutrition therapy. Most patients have nutrient deficiencies at the time of diagnosis. For example, large-scale studies have found that almost all women have vitamin D deficiency when they are first diagnosed with breast cancer. Vitamin D is needed for breast health as it plays key roles in immune function and breast tissue integrity. When our vitamin D levels drop below normal, we are in a carcinogenic state with a higher risk for developing breast cancer. By targeting and correcting deficiencies, we can dramatically change our health. This is true for specific nutrients and for broader nutrient categories, such as antioxidants and minerals. A poor diet not only increases the risk for cancer but also reduces the ability to heal from cancer. The average American diet contains processed foods, chemicals, agricultural pesticides, and lots of sugar and hydrogenated fats, all of which are associated with cancer risk. This type of diet leads to inflammation, which is a leading underlying cause of cancer development and the most common cause of fatigue in cancer patients. My smoothie recipes are chock-full of antioxidants and phytochemicals that reduce inflammation. Both patients and readers who drink these smoothies daily report greater energy and less fatigue. Creating functional smoothies containing active compounds has become a passion of mine, having seen the dramatic difference these drinks can make in an individual's health. Part of my process is to cull hundreds of studies on food nutrients found to affect recovery in various ways. First, I consider my patients' primary health concerns—for example, the side effects of chemo, which may include nausea, inflammation, fatigue, and muscle loss—and then I review the research to learn which food nutrients have been proven to support these conditions. I pay attention to contraindicated foods that can wreak havoc for those with breast cancer. Some breast cancer subtypes require that the diet also be free of phytoestrogens, which are plant compounds that mimic hormones and stimulate the growth of cancer cells. Since dairy products increase the growth of some types of breast cancer cells, I recommend cultured coconut milk, almond milk, or hemp milk instead of dairy. My recipes are void of processed sugar and unhealthy fats and are free of common allergenic foods, such as gluten, corn, dairy, and soy. I also take into consideration the synergistic effects of nutrient compounds in the ingredients. Pairing food nutrients can actually amplify the healing power of your smoothies. For instance, black pepper increases the anti-inflammatory effects of turmeric by up to 2,000 percent and vitamin C enhances absorption of the mineral iron by sixfold. Therefore, combining iron-rich foods like Swiss chard, cashews, and bok choy with foods containing vitamin C, such as citrus and greens, will increase the health effects of iron. This is no small matter, as iron deficiency anemia is a common health problem in the United States and Canada. A more exotic anti-inflammatory combination that has been used for thousands of years is turmeric with black pepper. Turmeric, the yellow spice used in curries, is rich in the phytochemical curcumin, which becomes more bioavailable when ingested along with piperine in black pepper. In addition, carnosic acid in rosemary enhances the effects of curcumin. Recent studies have also proven that the phytochemicals limonene and cineole, which are found in cardamom, enhance the effects of indole-3-carbinol (I3C), present in kale and other brassica family vegetables. Prebiotics, which are the nondigestible fibers that feed probiotics, such as acidophilus and bifidophilus, support the growth of microbes in the gastro-intestinal tract. Most of the fruits and vegetables used in these recipes contain prebiotics, such as betaglucans from strawberries. This means that adding probiotics to plant-based smoothies will help activate those microbes in your body. Having a healthy amount of microbes in the gut is necessary for proper digestion. An efficient digestive tract contains a wide variety of microbial strains that assist in digestion. Probiotics also enhance the effects of certain nutrients, for example, they metabolize anthocyanins from berries and pomegranate. I find these nutrient and microbial interactions to be endlessly fascinating. A few decades ago, when I first started making smoothies, there was limited research available. Today there are studies being published daily from around the globe that direct our food nutrient choices for healing cancer. From these, I choose the studies that provide the most direct dietary guidance. Some of these studies are done on animals, which is not only heartbreaking but also doesn't always provide information that is applicable to humans. Laboratory investigations with human cancer cells in petri dishes provide more direct proof of efficacy than many animal studies. Reports from human trials and correlational studies are the most revealing, as they involve direct testing of nutrients in humans, and they draw connections between nutrients and the health of populations. Researchers are getting so specific in their recommendations that they often provide dose details in the conclusion of the study. This is the gold that I am digging for when I am slogging through hundreds of studies. When I come across a report that provides the exact amount of a specific food used in the study that led to a positive health outcome (reduction in cancer, in this case), I can then replicate that dosage in a smoothie. For example, one recent study found that just two to three stone fruits per day (e.g., apricots, peaches, and plums) reduced the growth of breast cancer in the study's participants. I build my ingredients list from new research so that my recipes contain only effective cancer-supporting ingredients. I then use the USDA (United States Department of Agriculture) database to find the foods that contain the highest concentration of these desired food nutrients. To ensure that the ingredients I use are not contaminated with agricultural chemicals or depleted of nutrients through processing, I choose whole, unprocessed, organic, and non-GMO foods. The final step to creating my 'functional' smoothies is to take my ingredients to the kitchen, where I spend hundreds of hours developing recipes. And, voilà: the finished product is a variety of powerful, healthy recipes that target breast cancer. Patients who drink my smoothies daily often report their mood and blood sugar levels are more stable and that they have more focus and motivation. They also report that their energy has increased enough that they are able to work and exercise throughout treatment. If you want to take a proactive approach to preventing or healing cancer, one of the most effective steps you can take is to drink a breast cancer smoothie each day. It is my hope that you not only enjoy these recipes but that they fortify you to enjoy vibrant health. ©2016 Daniella Chace. All rights reserved. 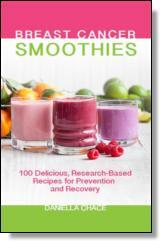 Reprinted from Breast Cancer Smoothies: 100 Delicious, Research-Based Recipes for Prevention and Recovery. No part of this publication may be reproduced, stored in a retrieval system or transmitted in any form or by any means, without the written permission of the publisher. Publisher: Health Communications, Inc., 3201 SW 15th Street, Deerfield Beach, FL 33442.